With the killing of the militants, the death toll of militants killed in encounters this year has crossed 200. SRINAGAR: Four militants including a top commander of Lashkar-e-Toiba were killed in twin gunfights in Jammu and Kashmir on Thursday. A police official said police, 10 Garwal and CRPF men launched a joint cordon and search operation in Fotlipora area of Pakherpora in central Kashmir’s Budgam district this morning after receiving specific information about presence of some militants. He said as the search operation was going on, militants fired on the search party. 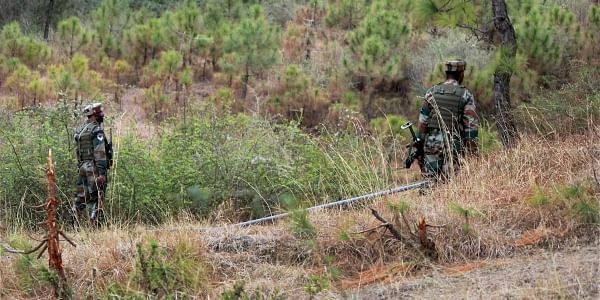 “The fire was returned by the troops and in the ensuing gunfight, which continued till late forenoon, three militants were killed,” the official said. The house, where from militants were firing on the security personnel, was damaged during the gunfight. Police identified one of the slain militant as Shabir Ahmad Dar of Pulwama. “The identity of two other slain militants was being ascertained,” the police official said. He said 3 AK rifles, 3 AK magazines, 111 AK rounds and other ammunition was recovered from the encounter site. As the encounter erupted in the area, local youth took to roads and attempted to march towards the encounter site amidst chanting of pro-freedom and anti-India slogans. They pelted stones on the security personnel, who in retaliation fired tear smoke shells, pellets and bullets to disperse them. At least six youth sustained injuries. Four of them were hit by pellets and two others by bullets. The injured were evacuated to hospitals, where they are undergoing treatment. Meanwhile, another encounter broke at Kumar Mohalla Sagipora area in Sopore of north Kashmir’s Baramulla district this afternoon after militants fired on security forces. “In the retaliatory firing, a Lashkar commander was killed,” a police official said. The slain militant was identified as Muzamil of Pakistan. “An AK rifle, 5 AK magazines, 124 AK rounds, 1 UBGL, 5 UBGL rounds and other ammunition was recovered from the encounter site,” the police official said. He said an army man also sustained injuries in the gunfight and has been hospitalised. With the killing of four militants in twin encounters, the death toll of militants killed in encounters with security forces this year has crossed 200. Many top and wanted militant commanders have been killed by security forces in operations this year. “More than 200 militants have been killed in 2017 alone. This marks a huge landmark for establishing peace and stability in the state and country,” J&K police chief S P Vaid said.